Welcome to Borgmanns Add 1! : ANOTHER Snow Day! That's right folks, the boys have another snow day today and we are completely snowed in. We got back from California just in time for another few inches of blowing and drifting snow. It's been nuts! Let's look back to a happier time. 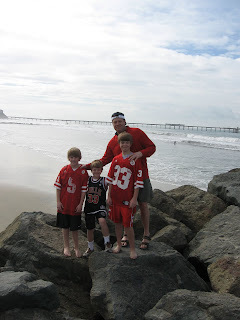 Here's a photo of Ben and the boys on the beach in San Diego on Ben's 40th birthday.